At the dawn of digital, many had predicted “the end of branding as we know it”—and while the discipline of branding has changed dramatically in the past decade, having a strong, differentiated, and focused brand is more critical than ever before. Increased competition, commoditization, and the speed of change call for brands to become the point of convergence and the catalyst for the alignment of business strategy, customer experience, and company culture. This new business and marketing environment requires a different approach to brand building and management. What does today’s leading professional services brand look like? It’s agile, purpose-driven, relevant, and grounded in a firm’s business strategy and steeped in its culture. Building a strategic brand foundation—a brand platform—that bridges business strategy and operational functions: business development, marketing, HR and more. Developing a unique and consistent brand voice that remains strong across a multitude of communication channels and devices that merges brand agility and brand consistency for today’s dynamic marketplace. Managing a firm’s brand, from effectively organizing brand and marketing assets to fully integrating the brand into the firm’s culture and its daily operations, behaviors, and decision-making. Developing a brand-based internal culture through effective engagement, training and education strategies that turns employees into proactive brand ambassadors. Creating a brand-based customer experience—today’s top differentiator and a weapon against commoditization. Understand the role of each firm’s function and department in creating the alignment between business strategy, brand, and culture and becoming a firm that everyone wants to work with and work for. It can be difficult to prove the impact and results of content marketing plan (especially with as many touches required over the A/E/C lead cycle). That’s why our instructor will walk you through exactly how she made a case for content marketing that generated new business, more time, and a new marketing position within her former design-build firm. In the A/E/C industries, firms are concerned about being too annoying to their clients. How do they avoid it? By doing absolutely nothing! In this session, we’ll discuss how to promote client-focused content that feels like assistance rather than a nuisance. Social media, email campaigns, and content frequency will be the focus of this session. There’s content all around you. You just have to find it—and then develop, polish, and repurpose it. In this session, we’ll discuss best practices on how to create client-focused content that educates your readers while establishing thought leadership. There’s enough sucky content in our industry, so let’s clean it up. Owners consistently say that they want to hire the firm that is “the best team.” But how do you come across as a great team during a one-hour new business interview? This webinar will detail a few keys to ensuring that you come across as a strong team and not a bunch of people that seem like they’ve never worked together before. Designed for marketers newer to the social-media-for-business space, this course will go over some basic tips and tricks to emphasize your company’s story. Whether you’re just starting to develop a social media presence or managing an existing one, this course will give you the foundation to use social media as an effective marketing tool. Armed with the basic graphic and photography skills learned in the two previous sessions, we’ll look at how they can be applied outside of proposals and presentations. There are big differences between the way we use visuals in printed documents and presentations vs. social media platforms. Each platform has its own set of rules; how do you know what works where? 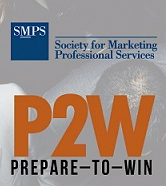 During this P2W session, we’ll look at some best practices for social media. We’ll explore ways to develop a social media strategy, the importance of compelling content, and some tips for maximizing exposure. We’ll look at how to create visuals that work for social media and the differences between each of the key platforms. We’ll even offer some resources to help you easily create and use effective, web-friendly graphics. Designed for marketers newer to the social-media-for-business space, this P2W session will go over some basic tips and tricks to emphasize your company’s story. Whether you’re just starting to develop a social media presence or managing an existing one, this session will give you the foundation to use social media as an effective marketing tool. A three-time marketing excellence award winner, Karen excels in graphic design, photography, and proposal writing, specializing in assembling complex pieces into concise and cohesive marketing materials. She is known for efficiency, creativity, and the drive to continuously improve her skills. Her career spans various industries including construction and commercial real estate. For eight years, she managed complex proposals and developed presentations, graphics, collateral, advertising, and project photography for two global construction firms. She is currently a Senior Graphic Designer for Cushman & Wakefield—a global commercial real estate firm—where she provides graphic design, photography, and marketing support for over 40 brokers in two markets. Karen is a CPSM and a member of Commercial Real Estate Women (CREW) and the Professional Photographers of America (PPA). She is also the owner of a Central Florida-based photography business specializing in real estate, portraits, and fine art. Designed to help marketers who are a little less graphics savvy, this course provides the fundamental photography knowledge you need to take your marketing to the next level. Whether you’re improving your own capabilities, working with professionals, or simply wanting to help your staff in the field capture better images, this course will give you the foundation you need to raise the bar. Photography plays such an important role in the world of marketing. The quality of the photos used to represent your brand can help or hurt you. Do you know how to tell the difference between good and bad ones? Designed to help marketers who are a little less graphics savvy, this P2W session provides the fundamental photography knowledge to take your marketing to the next level—and tell the right story about your company. Whether you’re improving your own capabilities, working with professionals, or wanting to help your staff capture better images, this session will give you the foundation to raise the bar. This session will cover the basics of photography as it applies to the A/E/C world. We’ll talk about stock photography, how to use the stock sites, and ways to choose the right images. We’ll explore hiring professional photographers and go over some tips and tricks for working with them. We’ll learn about copyright and what that means to you and your firm. We’ll even also provide some tips for taking your own photos. Does a non-standard company logo drive you bananas? How about company emails with a notebook paper background? Better yet, who loves Comic Sans? Every professional services firm has a unique style, yet very few have approved Style Guides. This webinar will discuss and explore the components of a Style Guide. Does a non-standard company logo drive you bananas? How about company emails with a notebook paper background? Better yet, who loves when a variety of formats and editing rules are used? Every professional services firm has a unique style, yet very few have approved style guides. Marketing and corporate professionals can be leaders in driving the creation of a company-wide style guide at their firms. It’s a great reference tool for all employees – from new hires, seasoned professionals, C-suite leaders, and technical and marketing staff. Our May webinar will explore the various components of a style guide. Part I: Brand Manual focuses on graphic elements such as logos, colors, fonts, and formatting. Part II: Writing Guidelines are specific to each company’s communication style and will include an abbreviated reference list tailored for company use of acronyms, software, and industry terms (typically following AP Stylebook). Understand how to get started and develop a style guide at their firms. This includes key benefits applicable at all levels: marketing and technical groups, as well as leadership. Discover the top reasons and selling points for a style guide at their firms. Understand components and layout of a style guide as a final deliverable. Through handout templates, develop a draft framework for their firm and priority levels for development and implementation. Julie Shaffer, CPSM, founded Shaffer Creative in 2012 with a vision: to provide creative marketing and graphic design solutions through communication strategy, company branding, photography, and data management. As an Adobe Certified Expert in InDesign CC 2015, she is a go-to expert for hands-on learning with professional associations and clients. She is a member of SMPS Fort Worth and served as Sponsorship Director and President. She was the 2015 SRC Communications Chair. Julie holds a bachelor’s degree in Communications with an English minor from the University of Texas at Arlington. Lindsey Kubes, CPSM, is a Senior Marketing Strategist with Shaffer Creative. Her passion is strategy development and brand implementation through efficient company communications and outreach. Lindsey has received 12 state, national and international awards for projects that span branding, direct mail, brochures, magazines, marketing plans, marketing campaigns and graphic standards. Lindsey was a founding board member of the SMPS Fort Worth Chapter and served as Secretary. She holds a bachelor’s degree in English and Professional Writing Certificate from Texas A&M University. Together, Julie and Lindsey have created brand manuals and style guides for numerous clients within the A/E/C industry. Most recently, their work was recognized with an AMCP international marketing award for the rebrand of Southland Holdings, LLC, that included new cohesive logo, marketing collateral and comprehensive brand manual. Designed to help marketers who are a little less graphics savvy, this course provides the fundamental graphic design knowledge you need to enhance your marketing materials. Whether you’re improving your own capabilities or simply wanting to work better with your graphic design staff, this course will give you the foundation you need to raise the bar. Graphics make your documents more readable and presentations more memorable—but only if they’re used well. Nothing turns off your audience faster than having poor quality visuals. Having a basic understanding of graphic design elements is essential for today’s marketer. But when there are thousands of options, how do you know which ones to use? And where do you begin? Whether you’re improving your own capabilities or simply wanting to work closely with your graphic design staff, this P2W session will give you the foundation to raise the bar. This session will help you take your marketing materials to the next level. We’ll talk about graphic file types, the difference between RGB and CMYK, and how photo resolution affects the end result. We’ll explore color and font choices and simple ways to customize stock graphics. We’ll go over some tips for streamlining page design and optimizing files for email vs. print. We’ll even share some resources where you can learn more! A/E/C firms love to talk about their culture to lure both clients and talent. Culture is the shared behaviors and beliefs of your firm. So, how do you share your culture with a prospective hire or client? Don’t they have to experience it? A/E/C firms love to talk about their culture to lure both clients and talent. Culture is the shared behaviors and beliefs of your firm. So, how do you share your culture with a prospective hire or client? Don’t they have to experience it? First, codify the shared behaviors and beliefs of your firm as written Core Values. Sadly, most firm leaders develop a set of banal Core Values at a weekend retreat, then send them out in an equally uninspired mass email to all employees. But, as you’ll learn in this webinar, Core Values can be so much more. A creative manifestation of your Core Values is a powerful marketing tool and an essential artifact of your culture. An artifact that prospective hires or clients can experience to determine if there is a match. David Lecours helps A/E/C firms attract and retain great clients and talent. He is Principal at LecoursDesign, a branding, and digital marketing consultancy. David is a two-time TEDx presenter and speaks at conferences worldwide. David co-hosts PSM: Professional Services Marketing podcast at psm.show. David is also passionate about surfing, pickleball, and succulents.